These homemade crackers are so easy to whip up, there will be no need to resort to that box of stale crackers from the supermarket again. Ideal for dips, spreads, cheese or anything else you fancy. Preheat the oven to 180C (160C fan forced). Slice the baguette into 3mm slices and place in a single layer on a lined baking tray. Combine olive oil, salt and pepper. Brush the seasoned oil over the bread slices with a pastry brush. Bake for approximately 8-10 minutes, until the bread has started to turn a light golden brown. Remove to a wire rack and allow to cool completely. I typically make this with baguettes, but it can be made with any slightly stale bread. Better results will be achieved with sourdough as the bread is sturdier to begin with. You can use any amount of bread to make these crackers. 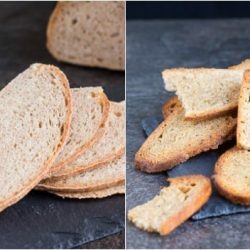 If you don't have enough bread initially to warrant turning on the oven, slice the bread and store in the freezer until you require toasts. These will store for at least a week in an airtight container. Keep an eye on these towards the end of the cooking time. They can go from light golden to dark and bitter in the blink of an eye.